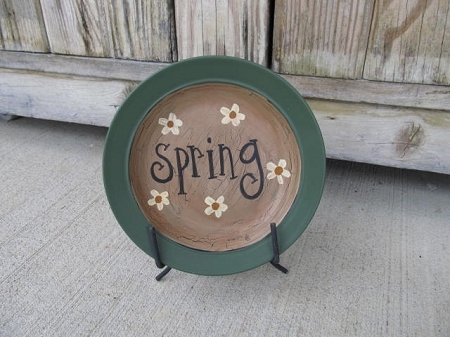 Primitive Shabby Chic Daisy Flower Buds Hand Lettered Mini Word Plate. Our mini word plates are a neat way to add a little touch of the seasons or holidays to your decor. A simply yet striking design! Choose your greeting and I'll handle the rest! One plate shown in the sage green with "Sunshine" and the other plate show in Burgundy with "Spring". Plates will vary but all are around 5"-6" in diameter. Hand painted, designed and signed by Heidi.